8.44am on the 15th April 2007. I was about to take part in my first marathon and knew I was woefully under prepared. It had all started in the previous October when I found I hadn’t made it through the London marathon ballot, or more accurately it started when I first took up running in May of last year with a loose notion that one day I’d like to run a marathon. Either way I was delighted to find that Paris was offered on a first come first served basis as Paris is an infinitely more attractive proposition than London. It is to me anyway. I started with a plan of running four times a week; once more than I’d been doing for the previous few months; as this seemed doable in terms of time and intensity. It was enough to lift my stamina and prepare my body but not as high as some of the five and six day plans I’d read about. I didn’t think my body could cope with more than four runs a week. I hoped that I might just manage to finish in under 4 hours, something my half marathon and 10 mile times suggested just might be achievable with good training, the loss of some weight and a little luck. Like any of that was going to happen eh? The plan kicked off just before Christmas and had a first long run of 12 miles on December the 21st. 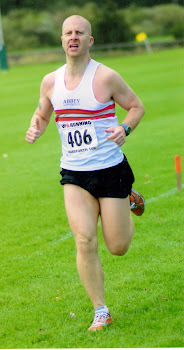 I’d done my first half marathon in October and had kept up 10-12 mile runs fortnightly since. I figured that that gave me a head start. Trouble is I didn’t run again until the 3rd January having unintentionally given myself Christmas and the New Year off. In hindsight that ill discipline was a bad way to begin marathon preparation. By the end of January I’d revised my plan down to three runs a week – the lowest I could find a plan for – and a plan more or less designed just to ‘get you round’. I hadn’t had a single week that had fully gone to plan. I’d found early in the month that the running club runs on Tuesdays and Thursdays just hadn’t been practical to include as I had no control over pace or distance. That left me having to run alone and in the short days of January that essentially meant between 9.00am and 4.00pm only, particularly as I wanted to run along the Leeds Liverpool canal. With work that wasn’t always possible particularly as I worked away on a number of occasions in the month. The one thing I’d been absolutely strict on was my weekend long runs and they’d always gone ahead to plan, although I confess that in two of the weeks they were the only runs I’d done. February’s training went much better. I still didn’t hit the target of three runs every week but I wasn’t far off – maybe averaging 2.5 a week – but I felt far more like a long distance runner. By the end of the month I had done a 20 mile run, was successfully using gels for my long runs and felt pretty happy with the way things were going. Sure, I’d accepted by then that four and a half hours was a more reasonable target than the three hours fifty nine I’d optimistically hoped for, but I was happy with that having done a couple of 15 mile long runs at that pace and with seemingly plenty left in the tank. In fact my immediate thought after finishing each long run was that I couldn’t wait until the following weekend and proceeded to think about them throughout the week. I suppose midweek runs felt like small beer in comparison and throughout my training that unconscious view probably encouraged me to feel they were expendable when faced with any minor obstacle to heading out and doing them. I’d also joined a gym so that on days when I only had free time before daybreak or after sunset I could at least do some sort of exercise. That was well intentioned and made sense at the time but with hindsight it just gave an excuse to miss the odd easy run – particularly as I replaced the runs not with the treadmill but with the cross trainer or rower. If February had been pretty good March was certainly bad. After a relatively easy 20 miler followed a week later by a marathon pace 15 miles I had no great fears of my first 22 mile run but it didn’t go well. It felt far more energy sapping than just being another 2 miles and the strong wind on the exposed tow path really took it’s toll. I was sore for a few days after and didn’t do any runs or other exercise for a week, and then did another 15 miles at marathon pace which brought the soreness right back. Again, with hindsight my limited training hadn’t prepared me enough for a 22 mile run. I just wasn’t ready for the damage it does to your body. The following week I played safe and rested, and at the weekend skipped my long run. All the books and articles suggested this was a wise move, and at the time it probably was. The trouble was that the following weekend arrived with a heavy snowfall. I was manically obsessed with long runs by this time and at 5.30am on the Saturday morning I was trying to dig the car out so I could go and run. Quite how I thought an hour’s shovelling snow would prepare me for an energy draining long run I don’t know. Not that it mattered, I couldn’t get the car out of the drive all weekend. Missing one long run was bad but missing two was a bit worrying. This was meant to be my peak training period after all. Unfortunately two was about to become three as a stomach upset that kicked in on the Friday night put paid to the following weekend’s long run too. I was three weeks from my first marathon and I’d run only once in the previous month. Was I panicking? Damn right I was. It was damage limitation time though and a 14 mile run at a very slow pace restored my confidence, and surprisingly I managed in those last 3 weeks to get my three runs a week in. After running along a barren canal side all winter there were the first signs of spring in the shape of a few nameless flowers and occasional buds on trees. That seemed to lift my spirits too. Training hadn’t gone too well but there was no time left to alter that, I just had to do whatever I could. Not that I was some serene, placid character. Deary me no. I was thinking about the marathon pretty much all the time; I had become a marathon bore – telling complete strangers about my plans and preparations; I wasn’t sleeping well and had fallen back on an old vice of mine when faced with stress: comfort eating. In the last 6 weeks before the race I regularly and secretly ate junk food and on several occasions would binge on up to half a dozen chocolate bars. That had been the icing on the cake (and I’d eaten a fair bit of that too) in terms of my failed attempts to lose weight while training. When I’d entered the race I weighed in at 12st 7lbs and had the intention of getting down to 12st by the following April. That should have been an easy enough task but after my Christmas excesses I was up to 13st 4lbs and by race day was a full stone heavier than when I entered. Snow, injury, stress and apathy had combined to ensure my weary legs would be carrying a lot more of me round the course than I’d hoped for. Ok, so training hadn’t gone too well and I wasn’t exactly svelte but that wasn’t the end of it. I’d travelled over to Paris with my family so we could have a little break together and my partner could see her sister who lived just outside Paris – and that was part of the attraction of Paris over anywhere else. Unfortunately keeping the family entertained on a mini break and staying off my feet as much as possible (as all the books and articles I’d read told me I should be doing) proved to be mutually exclusive. On the Friday we spent the day taking the kids round Disney in the sunshine and on the day before the race I had to walk to and around the Marathon expo for well over an hour and a half before we headed to my sister in law’s, not getting back until around 8pm despite my desire to rest and prepare mentally and practically from early afternoon back at the flat we’d rented. It was a lovely break though. I had a bit of a journey on the race morning. The alarm woke me at some unearthly hour, then I washed, breakfasted, thoroughly greased every orifice, crevice or point of potential friction on my body, gathered my kit and set off, with the family all still asleep. Rather than pay for a pokey, pricey and characterless hotel room near the start we’d hired an apartment over in the Oberkampf district of the city. A great place for a break but not too convenient for the marathon as getting there meant a fair bit of walking and two Metro journeys passing a great many ropey looking gangs on their way home from a night out. I made it in one piece though, stowed my bag and watched the sun rise while sat on a kerb on Avenue Foch. At about 7.30am I made my way to the head of the Champs Ellysses and found my pen. I’d stated when I entered that I expected to finish in 4 hours and that meant I was amongst a group of runners who were all likely to finish an hour ahead of me so I found my way to the very back, next to the most eager of the ‘any time over 4 hours’ runners, and sat down on the floor and waited. In fact, as I waited for the race to begin I felt incredibly calm. I wasn’t as prepared as I wanted to be in any way but there was no more time left and nothing more I could do, and that was an enormous relief. It almost felt like my fate was no longer in my hands and on that basis there was nothing for me to concern myself with anymore. 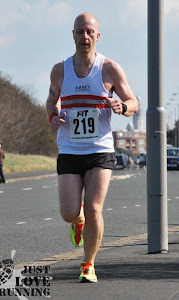 Through most of my brief running career I’ve been almost anally obsessive about pace and targets but even that failed to materialise as I sat and waited. The forecast high temperatures meant even the four and a half hours wasn’t going to happen as I really struggle in heat. My objective was simply to finish but if I could do that in under five hours I’d be delighted. I wasn’t going to be setting any pace or monitoring my split times as I ran though. 8.45 and the race began to huge cheers from all the 28,261 competitors. All, that is, except me. I just wanted to get quietly underway and stayed uncharacteristically introverted throughout. After a few minutes I was moving, albeit at a slow shuffle towards the start line. That was an adventure in itself dodging the thousands of discarded drinks bottles, bin liners, polythene bags and old t-shirts that littered the Champs Elysses. I took care. There was no way I wanted to end my first marathon 400m before the start line by turning an ankle on some Belgian’s discarded pop bottle. At 8.55 I’d made it to the start and broke into a slow jog, pressing my Garmin as I crossed the line. I was underway. Half a kilometre on and I’d stopped again, as I detoured to the right along with (seemingly) most of the other male runners as pre-race drinks and nerves tested the durability of even the most capacious of bladders. The beautifully manicured flower borders that lined the Champs Elysses wouldn’t have needed watering for at least another month. A minute later and I was off again. As I set off I glanced back along the Champs Elysses expecting to be a real back marker yet the whole avenue still seemed to be a sea of runners heading towards me. This was a BIG race. Around Place de la Concorde, alongside the Tuileries gardens and along Rue de Rivoli past the Louvre. These were areas I’d visited before and to run along these streets felt immense – running my first marathon past some of the most wonderful sites in the most beautiful city in the world. Not a bad way to spend your Sunday morning. I guess it beats Sunday League football or watching old episodes of Doctor Who on UK Gold. Well, it beats the football anyway. Along Rue de Rivoli I saw the first runner in a ‘Get Kids Going’ t-shirt. I was nominally running for the same charity, though I’d paid for my own entry, and I was shocked to see a number of runners running in the GKG t-shirts. I’d been sent what they had optimistically described as a ‘running shirt’ a few weeks before – a thick, heavy cotton t-shirt with a huge rubber transfer on the front and there was no way I was going to run in that. If I didn’t roast or bleed to death from chaffing I’d have surely had a heart attack from lugging the weight of a sweat sodden shirt around with me. Utmost respect to anyone who ran in one. Other firsts on the Rue de Rivoli were the first group of Sappeurs Pompiers who lined the route and were absolutely fantastic in their support; the first runner to collapse (after less than 2 miles) and the first shout of encouragement aimed specifically at me. I’d written ‘MOFO’ on the front of my white running vest as I thought it would amuse me to hear French people innocently shouting ‘Allez Mofo’ as I ran, plus it might offend Evangelical Americans, which would amuse me even more. It worked on both counts. 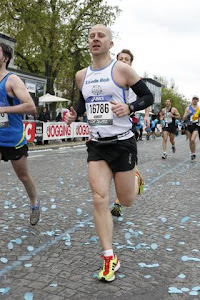 As Rue de Rivoli became Rue Saint-Antoine I marvelled once more at running in the Paris marathon. This time it wasn’t the grandeur of the location but simply the way so many of the city’s inhabitants were there to support the runners. There were ancient ladies waving from 3rd storey windows or shouting and banging the shutters - thoroughly enjoying the occasion; and a Muslim woman veiled from head to toe but ‘high fiving’ any runner who went near her! It was also noticeable round there the way the crowd mix with the runners. There were no barriers here (or pretty much anywhere) to keep the crowd back so they were able to mix with the runners and occasionally get in their way but it made it feel sort of homely – no them and us. I guess it’s a peculiarly French thing – think Tour de France. As I plodded up to Place de la Bastille along the shady Rue Saint-Antoine I was thoroughly enjoying myself. It was easy: a nice little jog in pleasant weather whilst cheered on by the crowds. At Place de la Bastille I even passed the family and smiled and waved to them as I jogged by. Place de la Bastille marked the first of Paris’s enormous water and feed stations so it was time to fill up the small water bottle I was carrying round with me as it was nearly empty. As I approached the station there were water bottles everywhere – just as lethal to the unwary runner as the banana skins lay alongside them like fruity landmines. I looked along the tables and they were empty. Few people were stopping by other than to grab a half banana, wedge of orange, sugar cube or date (the food was great). I then heard the volunteers manning the station all anxiously declaring “No water, no water” to any runners that approached. That couldn’t be right could it? They’d run out of water with several thousand runners still to pass through? Before the start the guy on the PA had been regularly reminding runners that it was going to be very hot - it was already in the early 20s before 9am - and that they should ensure they drank plenty on the course. Everyone must have listened because at place de la Bastille the cupboard was bare. I wasn’t too worried - there were plenty of other drink stations after all - but as I left Place de la Bastille and headed along Rue du Faubourg Saint Antoine my mood changed a little. It was still early and at the pace I was going along the shady streets the warm weather was quite pleasant after a winter of running along an often icy Leeds canal side but other runners didn’t seem to be so ambivalent about being water-less. The roadsides were covered with discarded water bottles lying on top of one another and several runners – who looked like multi-marathon veterans to me - were carefully picking through these to find ones with a mouthful of water left and were tipping these into single bottles to make themselves a drink. If they were happy to lose several minutes doing this perhaps it was more serious than I’d thought? Half a mile further on and there was an old water fountain at the side of the road, one of those in the shape of a lion’s head spewing water into a small trough, and I joined the small queue of runners filling up other people’s discarded bottles. Perhaps it was wise to get any water I could. I plodded on past Place de la Nation and along the wider Cours de Vincennes and Boulevard Soult. Things were still good but away from the shade the sun was feeling ominously warmer. The end of Boulevard Soult marked 10km and the second water/feed station. I looked at my watch: 68 minutes. I was running slower than on any training run and was just outside 5 hour marathon pace. I wasn’t concerned. All the advice I’d heard was to take it easy early on and conserve energy and anyway I’d lost 2/3 minutes getting water at the fountain and letting it out on the Champs Elysses. I was doing ok, all things considered. Time to get some water as my bottle was empty. Think again: the second water station was empty too and this time the number of desperate runners (and volunteers) searching through the empties for a few drops of water was markedly higher. Rather than stop and scavenge I grabbed a chunk of banana and kept going but now I really was starting to worry as the sun was getting hotter and the opportunity to run in the shade appeared to be disappearing. In my marathon belt I’d stored a €20 note in case of some emergency – my bag having been stolen or lost at the finish or something equally catastrophic – but when I saw a food and drink kiosk open a few yards off the route at the entrance to the Bois de Vincennes I decided to buy a bottle of water. I was worried about when I might next get some if I didn’t. In shorts and trainers and wearing a number it was fairly obvious I was in the race and I hoped that would make sure I got served pretty quickly but I stood for a minute (that felt like an hour) while the proprietor changed a gas bottle and chatted to his friend before giving me my wonderfully cold bottle of Evian. Feeling slightly more relieved I set off again. As I carried on along Avenue Daumesnil the support thinned out a bit but there was still plenty of vocal encouragement as we entered the Bois de Vincennes. Occasionally Sunday morning runners passed us in the opposite direction and I wondered what they made of the mass of marathon runners heading past them. Somehow the trees in the park didn’t seem to offer much in the way of shade and for the first time I was just beginning to feel the heat as a hindrance rather than a welcome novelty. I certainly hadn’t trained for heat. I passed the second sponge station and dipped my cap into the bowl of water and plopped it back on my head. In this area the park was still reasonably built up with municipal and private sports grounds and the odd posh looking restaurant, not to mention the Paris zoo, all being close by but it was still a nice place to run. At about 14km an ambulance came rushing past with siren blaring to a female runner who looked in a pretty serious condition. I suddenly remembered it was hot and I was low on water again but fortunately another water station was at 15km. As I approached it I got talking to a stocky, bearded young German who despite his solid stature was a bit of a marathon regular (apparently the Isle of Mann hosts a fantastic marathon. Really.). As we passed the station – the first to have a few bottles of unopened water left – I managed to lose him. Its not that he was poor company its just that I’d trained alone and now wanted to compete with only myself for conversation. A kilometre or so further on and there was another ancient fountain and I queued again to fill up my bottle. By this time the sun felt hot and I was constantly thirsty, taking any chance I could get for water. At 17km, on Avenue de Gravelle was another sponge station and this time, like many others, I not only wet my face and head from the big red bowls I also filled my water bottle there. Imagine the number of people who had soaked their sweaty faces from those bowls, or rinsed their sweat soaked caps in there and I was now going to drink that water. Not that it bothered me then or now – needs must. A little further still a fireman was hosing down runners to cool them off. I aimed to go straight through the cooling mist but he seemed far more interested in hosing the fronts of the younger female runners. I felt worthless and rejected. As the course left the park we passed a more residential area and the numbers of supporters grew again. We also passed another old fountain and I queued once more only to find a well stocked drinks station a few hundred yards further on at 20km. At this point I checked my watch again and saw I was on course for round about 5 hours having speeded up without realising it in the park. 1.1km on and I passed the half marathon point and somehow it suddenly seemed so much hotter. I don’t know if it was just the time of day or that the course had now left behind the greenery for sun baked stone and concrete but it was tougher all the way from there. Between there and Place de la Bastille (second time around) it seemed far busier in terms of support and participants and I realised how much I’d enjoyed the Bois de Vincennes and it’s wider spaces. Along here I seemed to be running vaguely near to a group of Cornish runners from (I think) the Tamar Trotters for a mile or two. Whenever the men in the group saw a union jack along the route (or a Briton in the crowd spotted them) they seemed to smile and shout something patriotic in a Brits Abroad kind of way. That’s not something I did once. I wanted to blend into international anonymity even if that did cost me a bit of extra support along the way. From Place de la Bastille the course quickly headed to the banks of the Seine where I hoped it would be cooler by the water. I was wrong. I then ran along a busy, really well supported 8/10km section alongside the river past some really famous monuments. Unlike London the Paris Marathon really does go through the heart of the city. The most memorable point of this was a long tunnel with little air but a merciful break from the sun. For some reason a number of people seemed to have pulled up here with blisters. I had no such worries with about half a kilo of Vaseline applied to each foot before the race began. Towards the end of the river side section at about 31km I passed a drinks station right opposite the Eiffel Tower and yet somehow I managed to miss the view. I’m not sure how as it must have been visible for much of the section. I can only think that I’d become far more introverted, only taking much notice of myself and those immediately around me, as the temperatures rose yet further and the miles began to take their toll. At the station they had water and (for the first time) Powerade and I opted for the latter. I’d been taking SIS gels every half hour but as I was going to be on my feet longer than planned I thought a little extra energy wouldn’t go a miss. I’d been eating a mouthful of banana at most drinks stations too but I’d only bought enough SIS gels for a 4 hour race – I don’t know how I managed that oversight. Not sure if the Powerade was a good choice though. It was a warm, sickly lemon and lime flavour concoction that didn’t satisfy my thirst one bit. I forced down half the bottle and for the first time in the race left the rest. The course left the Seine a couple of kilometres further on and I still felt pretty good, all things considered. In fact when my Garmin beeped for 21 miles I suddenly felt really fresh. I don’t know if it was the thought of only five miles to go, the gel, the Powerade or pure stupidity but not only did I feel good, I decided to speed up. For about half a mile I was slowly passing other runners but then when I reached the Roland Garros stadium I slowed right down. I hadn’t intended to, I just felt like my legs suddenly didn’t have the energy to carry on like that, and what’s more I wasn’t bothered. Only later did I realise I’d hit the infamous wall. Even on my 22 mile training run I’d not noticed anything that felt like ‘the wall’ to me and with more gels and heat/fitness induced slower pace I’d not expected to experience anything almost until the end of the marathon. I also didn’t know what to expect. I’d read about people just wanting to stop and seen film of runners staggering round like drunks on coverage of the London marathon and neither of those happened to me. I just felt like I was running on empty, which was more or less what was happening, but kept repeating to myself as an occasional mantra ‘there is no wall’. It might sound daft but I think that helped and by not recognising the wall (or refusing to recognise it?) it didn’t impact me as much as it could have, even though the remainder of the marathon felt very different to what had come before. My response, at Roland Garros, was to reach for my emergency rations: a caffeine enriched gel I’d bought at a sports shop the day before and was carrying as an unplanned extra. That was a shock. I’d been used to the semi-liquid of the SIS gels (if you’ve ever sucked blackcurrant jelly in and out of your teeth so it becomes a viscose liquid then you can imagine the consistency and the taste). They weren’t too bad but this stuff was like a sickly-chewy-sugary mass with a hint of awful vending machine espresso coffee for bad measure. It tasted awful and had to be swallowed with water; and I can’t say I noticed any big kick from it. You live and learn. I rounded the corner to the drinks station at 35km and for the first time I walked. I hadn’t intended to walk at all but I suddenly had an urge to do so and allowed myself to walk through the drinks station. The first aid section there was getting plenty of use and looked more like a wartime casualty clearing station than a drinks station, lots of blisters, staggering runners, some sat down on the kerbs with their heads bowed in exhaustion and one guy (who must have fallen) with a bloody dressing on his head. Another bottle of water collected and off I went. As I plodded along the Allee des Fortifications I saw the first of the free wine vendors. The toiling runners were largely ignoring them and I knew damned well that a glass of wine at 23 miles wasn’t going to do me a world of good either but the tourist in me took over and I found myself taking a glass from the proffered tray. It was the Beaujolais Nouveau stall and the wine had clearly been stood in the sun for some time making it more akin to vinegar than vino. I necked it quickly and washed the taste away with a swig of my once more dwindling water but to my dehydrated body and sugar starved brain it felt more like a bottle of wine than a glass. I turned another corner onto a path in the Bois de Boulogne and felt very, very hot. There had been some dappled shade for a mile or so but here the sun beat down mercilessly upon the runners. I found out later that the temperature on the course had peaked at 32c. I’d never run in temperatures like that let alone completed a marathon in them. The paths through the Bois de Boulogne seemed endless and emotional. One moment I’d feel euphoric, the next I just wanted it to be over but never at any point did I feel I might not complete the course. It was here that I passed the most memorable of the 80 or so ‘acts’ that lined the route: the gay runners of Paris. All there was, was a group of slim, shaven headed guys in pink t-shirts prancing around while fluttering pom-poms to a Kylie Minogue track, but to me they were hilarious. Maybe it was the wine? I ‘d learned my lesson with the latter though: I politely declined the wine at the Marathon du Medoc stall, the later cognac and also the cake that was by now appearing at all the drinks stations. I told you the food was good. It wasn’t long before I walked again. There had been a great many people walking since midway through the Seine section and many appeared to be using a run-walk-run approach to get through the later miles of the marathon. I’d tried to carry on running but it was slowly becoming apparent that by this stage my run was no faster than many other peoples’ walks so I walked myself. If anything it was quicker and certainly felt easier but I soon started running again (or at least simulated the movements) as it was a matter of principle: I was there to run a marathon not walk one. At about 25 miles there was one last group of firemen hosing down all the runners but even with that refreshment for the first race ever there was no big finish from me. I don’t know if I couldn’t manage it or whether it just didn’t seem important but I plodded on for the final mile much the same as before. By this stage there was a group of runners all more or less keeping pace with each other. There was a father and daughter helping each other to keep going, a British guy whose wife shouted ‘only 200m’ to the finish to him as we passed her and various others whose names I can’t recall. As I entered Avenue Foch with the finish in sight a female runner with ‘Elspeth’ on her back was running a few paces in front. She seemed to be done in and virtually stopped. As I reached her I patted her on the shoulder and said something like “Come on Elspeth you’re almost there, you can’t walk now” and she carried on. I know, the irony of me who’d already walked twice saying that but she carried on and staggered over the finish line a couple of paces ahead of me. And that was it. With no sprint finish, no great fanfare and thankfully no great drama, I’d completed my first marathon. I staggered through the chutes, collected my (excellent) medal, had my chip removed, grabbed an apple and a bottle of water. I checked my Garmin: 5 hours, 31 minutes. Far slower than I’d ever have imagined but the key thing was that despite the heat and with poor preparation I had become a marathoner. The other thing I’d noticed from the Garmin was the distance. It hadn’t seemed to match the mile/kilometre markers almost from the word go and yet it was usually pretty reliable but by the finish it said I’d done well over 27 miles. Talking online to others I found that they had had the same thing. The marathon is measured precisely and the measured route exists as a blue line on the course. Stray from that line by weaving in and out of people, heading to drinks stations, sponge stations, impromptu toilet stops or simply taking a wider line round bends and you find you run far further than a marathon! Since the marathon I’ve had 6 weeks of running really well followed by 10 weeks blighted by injury. I’m hoping the injury is almost mended as tomorrow registration for Paris 2008 opens and next year I’ll be a marathon veteran with a score to settle.